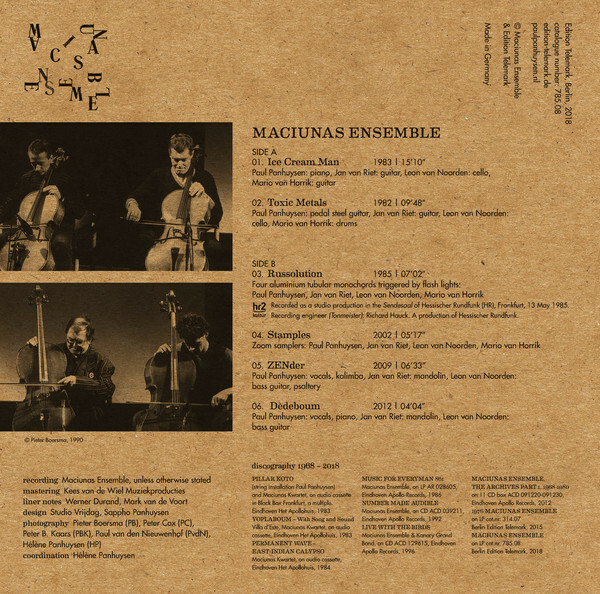 The Maciunas Ensemble was founded in Eindhoven, The Netherlands, in 1968 as a free improvisational music group that set out to realize the score "Music for Everyman" by Fluxus initiator George Maciunas, which they interpreted as allowing total freedom in the sounds being produced. In the mid-1980s, after a number of personnel changes, the group settled on the line-up of artists Paul Panhuysen and Mario van Horrik, musician Jan van Riet, and scientist Leon van Noorden, which remained stable until Panhuysen's death in 2015. The group met and played on a regular basis, usually improvising on instruments that were at hand and recording every session. Before playing the next session, the previous recording was listened to and discussed. In 1980, the Eindhoven art initiative Het Apollohuis, also the home of Panhuysen and his family, became their home base, a place that subsequently gained fame for being one of the first and longest-running venues for sound art and experimental music in Europe. In the recent years, the Maciunas Ensemble has begun to go through its vast archive of recordings and to select material for publication that remained unreleased so far. The first bundle of archival recordings, dating from 1968 to 1980, was released on an 11-CD set on Apollo Records in 2012. For their 50th anniversary in 2018, the second part of archival recordings is to be published, its first instalment being this LP on Edition Telemark comprising unreleased tracks recorded between 1982 and 2012. More archival material will be released in digital format by the ensemble. 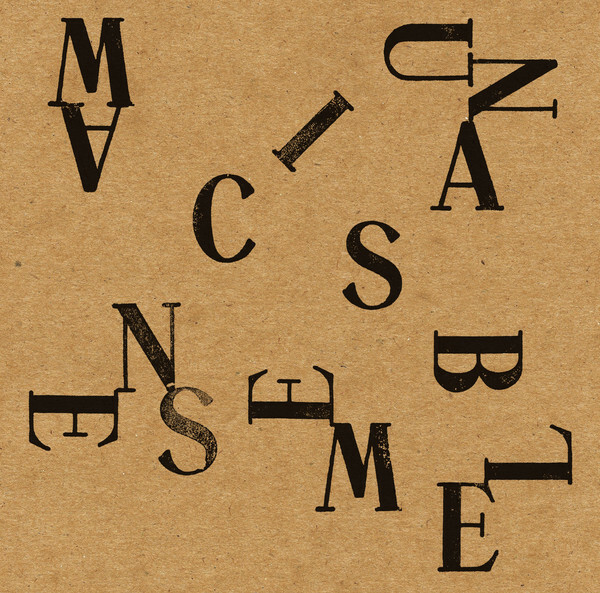 This LP allows a glimpse into the musical directions the Maciunas Ensemble has been undergoing during those 30 years. Side A features "Ice Cream Man" and "Toxic Metals", two repetitive, thundering tracks from the early 1980s played on guitar, piano, and cello, and heavily inspired by minimalist rock and post-punk music. Side B contains four shorter tracks: "Russolution" (1985), played on self-built aluminium monochords, "Stamples" (2002), employing sampled voices, and "ZENder" (2009) and "Dèdeboum" (2012), both improvised tracks on vocals and a number of instruments.